Well-known and extremely talented musicians Tanya and Dorise are frequently heard performing their amazing guitar and violin instrumental arrangements of popular songs on the streets of the French Quarter, usually surrounded by a large crowd of admiring onlookers. The popularity of this amazing duo had resulted in them making appearances at weddings, which was always a real treat for guests, but unfortunately the pair have since gone their separate ways musically, are no longer regularly performing together. 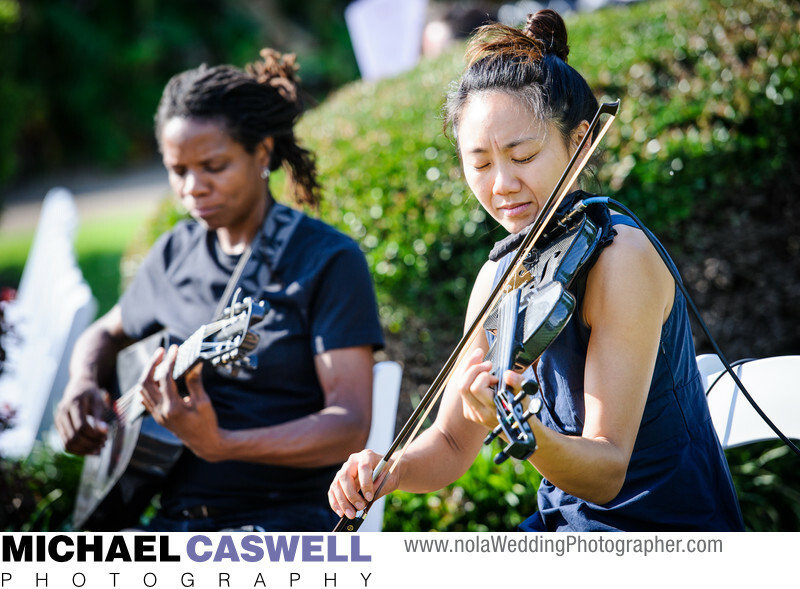 In this image, they bring their unique style of music to a wedding ceremony in Jackson Square on a gorgeous June afternoon, playing prelude music prior to the start of the ceremony, and then providing the music for the ceremony itself. Location: 700 Decatur St, New Orleans, LA 70116.